Missing U.S. Mint ‘Certificate of Authenticity’ Worried Coin Collector. What is It? A Los Gatos, California coin collector collects United States Mint coin sets. Like many grandfathers, he purchases coins for his grandchildren. Because they are gifts, he also pays particular attention to not only the coins but the packaging around them. According to abc7, KGO San Francisco, this particular grandfather was worried that the value of one of his sets was greatly depreciated because it lacked the proper Certificate of Authenticity from the U.S. Mint. The Mint inadvertently sent a certificate from different set. 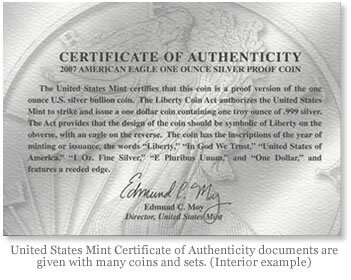 Does the Certificate of Authenticity within U.S. Mint coin sets add value? While the grandfather and news reporters did not know how much the certificate added to the set’s value, an interview with a local San Francisco coin dealer, Dean Witter, properly placed it in perspective. It’s the coins that command the premium … not the certificate or attractive packaging around it. Regardless of the value aspect of a certificate versus the coins, when you buy something and a Certificate of Authenticity is promised, you certainly want it and should get. Especially and more so, when the collection is an intended gift to a grandchild. The article and video media story, Coin collection value worries local man, happily reports that the Los Gatos grandfather did finally receive the correct the U.S. Mint certificate. United States Mint Certificate makes easier to sell coins or medals minted at U.S. Mint! No Certificate make it difficult sell them!